The great thing about three-day weekends is that there’s plenty of opportunities for catching a few flicks. So far I’ve watched Black Panther (really good, 4.2 out of 5), Halloween III: Season of the Witch (surprisingly decent, 3.5 out of 5), and this morning I caught the ninth entry in my Rewatch Review series, Mama. I honestly thought this film would be painful to watch, but…you know what, let’s get into the review. WHAT’S IT ABOUT: Mama is about Victoria and Lilly, two young sisters who disappear after their father goes on a murder spree after the 2008 market crash. They show up several years later after living in the woods all this time and are sent to live with their uncle Lucas and his girlfriend Annabel. Pretty soon they start experiencing weird things and find out that the girls weren’t exactly alone in those woods. Someone, or something, was there with them. And it’s come back to civilization too. WHY I DIDN’T LIKE IT: You know, I honestly don’t remember. I just remember not liking it when I saw it back in college. WHY I REWATCHED IT: The director, Andy Muschietti, produced 2017’s It, and that rocked. What the hell did I miss in Mama that made studio heads select him to be the director after Cary Fukunaga signed off? THOUGHTS: Apparently I missed quite a bit. 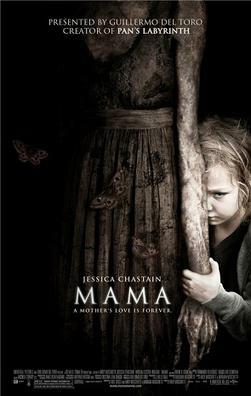 Mama‘s a great horror film. For one thing, the actors put their all into their characters, and it works. You really see the arc of Annabel, played by Jessica Chastain, going from a carefree rocker girl who doesn’t want to be a mom at all bonding with the girls and growing into the role of a mother. And watching the girls adjust to civilization is fascinating for each one. And seeing these three very different and clashing people come together as a family is heartwarming, but in a way that doesn’t take away from the horror of the film (*cough* unlike Before I Wake *cough*). Not only that, but the film does know how to set up a creepy atmosphere while also using jumpscares. I found myself hopping in my seat more than a few times. And as the film goes on, it manages to up the creepiness without showing too much of the titular Mama, who for a horror movie villain is actually kind of sympathetic once you get her backstory. It was genuinely scary. Of course, the film isn’t without its problems. At times, while Mama’s design is creepy*, the CGI used to make her can be a bit distracting at times. And the music in the final scene kind of makes this really heartbreaking scene kind of melodramatic and sappy. I’m sure the idea was to heighten the sad emotions, but it backfires for me. And hoo boy, that movie was loud. I turned down the volume and I was sure my neighbors would knock on my door and ask me to turn it down! JUDGMENT: I honestly don’t know why I disliked the film anymore, and I can see why Muschietti was tapped to direct It. Mama is a terrifying but heartwarming horror movie with a great premise and wonderful characters played by accomplished actors. On a scale of 1 to 5, I give this film a 4.5 out of 5. I’m so glad my opinion changed on this one. Well, that’s nine films rewatched. My last one might take some time to find, as it’s not usually available in the States. Still, I’m looking forward to it, and I hope you are too. Until next time, pleasant nightmares, my Followers of Fear. *And is probably the inspiration of the look for the abstract painting woman from It. Not kidding, look at those two side by side. They’re basically the same character with a different style…so there’s a King/Muschietti shared cinematic universe now? It’d make sense, this movie does feel like it would fit as a Stephen King adaptation. Might be a good idea. Hope you like it when you see it.